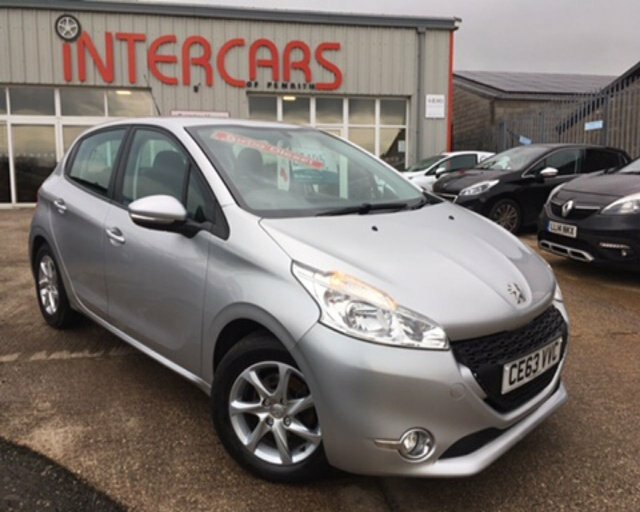 2013 63 PEUGEOT 208 1.4 HDI ACTIVE 5 DOOR 68 BHP FINISHED IN ALUMINIUM SILVER WHICH IS COMPLIMENTED WITH BLACK CLOTH INTERIOR. THE 208 1.4 HDI IS A VERY COST EFFECTIVE CAR TO RUN GIVEN THE LOW INSURANCE GROUP, NIL ROAD TAX, AND 60 PLUS MILES TO THE GALLON. THE ACTIVE MODEL COMES WITH THE FOLLOWING FEATURES ALLOY WHEELS, AIR CONDITIONING, HANDS FREE BLUE TOOTH CONNECTIVITY, REMOTE LOCKING, ELECTRIC FRONT WINDOWS AND MIRRORS. CALL US TODAY TO ARRANGE A TEST DRIVE AND VIEWING WE OFFER EXCELLENT P/X PRICES AND FINANCE PACKAGES TAYLOR MADE TO SUIT EVERY BUDGET. Available as a sporty three-door or a more practical five-door, the Peugeot 208 boasts finely sculpted exterior styling, a sporty stance, innovative technology and a refined interior that makes this car a pleasure to spend time in. Come and discover the full range of used Peugeot 208 cars for sale in Carlisle today by paying a visit to our showroom in person. You can also view our complete stock online here on the website. Each and every vehicle on our forecourt has been thoroughly checked and inspected by a trained technician before going on sale, meaning when you come to Intercars Of Carlisle Ltd you'll always be able to buy with complete confidence.